This study explores the impacts of alternative emission control interventions for international shipping on the European Seas on relevant air pollutant emissions, examines their consequence on ambient air quality in Europe and the neighbouring regions, and explores the resulting improvements of human health. It estimates the costs of the various policy interventions, and compares them with monetized benefits on human health and other impacts. It is found that further controls of SO2 emissions, e.g., through SO2 emission control areas, could deliver rather fast benefits, and avoid by 2030 up to 4000 cases of premature deaths annually, and 8000 in 2050. In the longer run, by 2050, application of Tier III NOx standards could double the health benefits. Even when using the lower (most conservative) health valuation, all reduction measures examined in this report emerged as cost-effective, with monetized benefits exceeding emission control costs typically by a factor of 6 in 2030 and by a factor of 12 in 2050. 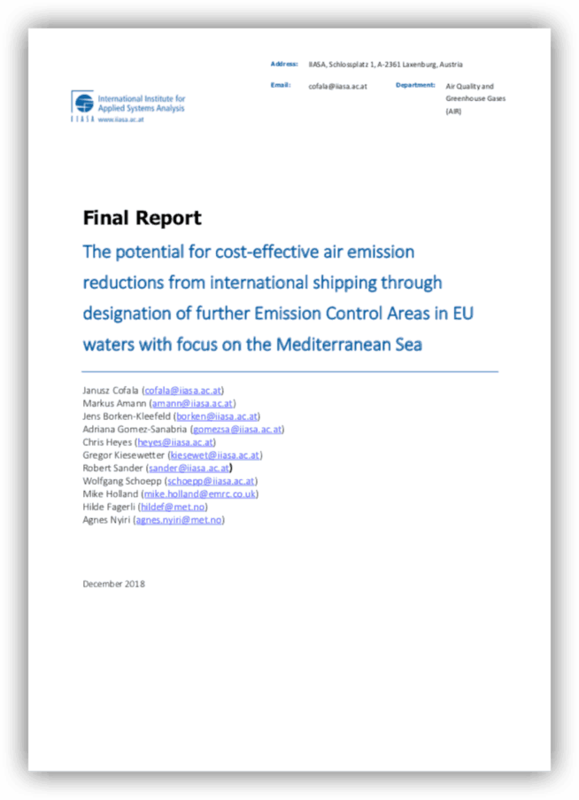 Designation of the Mediterranean Sea as an Emission Control Area could by 2030 cut emissions of SO2 and NOx from international shipping by 80 and 20 percent, respectively, compared to current legislation. These additional emission reductions could avoid 4,100 cases of premature deaths in 2030 and more than 10,000 annual premature deaths in 2050. Even with the most conservative assumptions for health valuation, monetized benefits are on average 4.4 times higher than the costs in 2030 and 7.5 times higher in 2050.